The Nunchaku is a weapon whose manufacture requires only very common materials, especially nowadays. 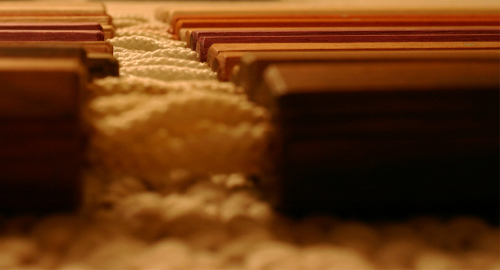 Traditionally, the Nunchaku sticks were made out of oak or medlar tree. The wood wad soaked in mud during several years: the lack of oxygen prevents its decomposition, and the result is a harder and much resistant wood with which the Nunchaku can be manufactured. Nowadays, this old tradition is lost, and a Nunchaku can be built starting from a lot of different materials. We will divide these materials into three parts: wood, metal and synthetic materials. All these materials have his own properties, and the Nunchaku can be used in a different way according to the material used. 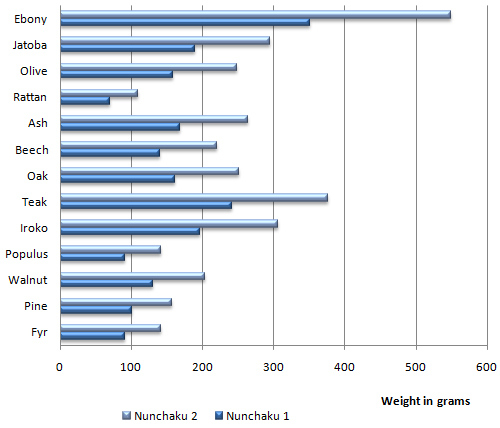 - Nunchaku 1 has 32 cm length and 2 cm diameter sticks. - Nunchaku 2 has 32 cm length and 2,5 cm diameter sticks. 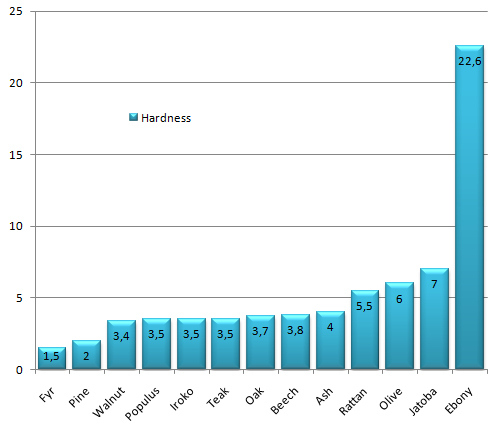 Here is a graph which compares the average hardness of woods previously studied, the unit used is the Brinell (noted HB). For the comparison, we apply a metallic ball with a very great force to the tested materials, the Brinell is the relationship between the value of the applied force and the volume of borrows left in the material. As an indication, the stainless steel has a hardness of about 200 HB. Metal is another material which is very often used to make Nunchakus: from iron to aluminium, passing by steel, you can find a lot of metallic Nunchakus. Metal used always had a tube shape: indeed, a block of full metal would be too heavy. This type of Nunchaku is very resistant and it can’t break: it can only have some bumps resulting from violent shocks. According to the metal used, it is very easy to choose the weight of the Nunchaku we want to build, whereas it is a much more delicate operation with wood, because there are always small differences from one piece of wood to another. Metal is also appreciated for its visual aspect: it reflects the light like a mirror, which leaves a very pleasant effect to look at. 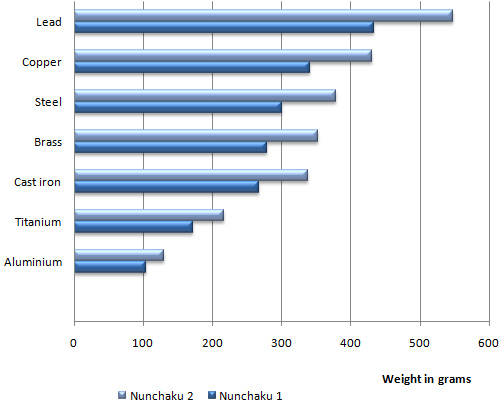 The following graph compares the weights of two Nunchakus build from various types of metal. The branches are here 1 millimeter thickness tubes, and the other characteristics are the same as Nunchakus used for the precedent graphs. Among other materials used, the most common is the foam Nunchaku, which is used for training purposes to avoid being injured: this type of Nunchaku has made the training much more accessible. We can also find Plexiglas or transparent plastic Nunchakus which are generally used to make a Nunchaku glow using a diode: these ones are only made for spectacle, because they are less resistant. Sometimes, ropes are replaced by chains. They are much more resistant than a simple rope but less flexible (because they are made up of rigid links). A long time ago, and especially on Nunchakus with 3 branches, additional links were attached to the chain: that made noise during the handling of the weapon, the goal was to frighten and disorientate the enemy. Nowadays, noisy Nunchakus are sometimes appreciated by certain practitioners, which find that it adds an aggressive dimension to their weapon and their style. In general, techniques are easier to learn with a chain, because its inflexibility will "help" the practitioner to carry out his movements. With a rope, if a movement is not carried out perfectly, the flexibility of the cord will amplify the mistake, the movement will be very vague and will not have any power: the loss of control is then inevitable. Learning with a rope forces to carry out each movement perfectly, whereas learning with a chain allows to learn a great number of movements, and to improve them later. With a few years of experience, a practitioner doesn’t note any differences between chain and cord concerning the handling, although these differences are obvious for a beginner.